Before you ever begin to create a product video, you need to have your video strategy in place and understand exactly who your customers are. To do that, you must think through exactly how you plan to use each video, who is watching these and where they are consuming your content. Obviously, product page videos need to showcase various aspects of your product to potential customers that they couldn’t see in a static photo, but these people also need to see themselves in your videos. For fashion retailers, that may mean using models to show how a product looks when walking down the runway with all eyes on them. For online stores selling outdoor recreation items, it may be best to show a product in use on a camping excursion with a beautiful background of lakes and mountains. 49% of online shoppers say not being able to physically touch a product is one of their least favorite parts of shopping online. Forty-nine percent of online shoppers say not being able to physically touch a product is one of their least favorite parts of shopping online. Your goal with your product page video should be to bridge that gap and provide a more holistic buying experience. Put the product in scenarios your customer might use to test it out when in the store. Product videos won’t just be used on a product page. You will want to use them in email nurture streams and in social advertising on platforms like Facebook and Instagram. Knowing how you will use a video will help to minimize costs and time spent in creating a video. You can knock out all video uses with a single day of shooting. Aim to optimize your time and resources by properly planning. Here’s what you need to think through. Where will you use the product video? These are 6 psychological triggers online marketers can use to increase sales and conversion. Learn how to use them now. Below are the three main channels product videos are used and distributed. Be sure to get as specific as possible in thinking through where you will use each of the videos. For instance, if you have multiple email nurture streams, differentiate between them. A product video for a welcome series email and a product video for an abandoned cart email have slightly different messages. In one, you want to introduce your brand and a popular product. In the latter, you want to encourage a final purchase with customer reviews, urgency or any other psychological trigger. Think through what is right for your brand. Again, these are three of the more popular use cases. What is the purpose of the product video? The purpose of the product video will be largely determined by where the video lives. Be prepared to record different voice-overs or multiple bumpers (the video clips before and after the main content of a video) to use for various product video purposes. Here are the three main purposes of any product video, and the use scenario(s) that most closely aligns with each. Increase conversions: product page, welcome series email, Facebook advertising and Instagram advertising (targeting existing customers). Increase AOV: product page, welcome series email, Facebook advertising and Instagram advertising (targeting existing customers). Attract new customers: Facebook and instagram advertising (targeting net new customers), distribution on YouTube (welcome series). What does each video need to achieve its purpose? BigCommerce partners with hundreds of design and solution partners to help customers grow their brand with the help of industry experts. Find one that fits your needs. Video shoots can be difficult, long and expensive –– but not for the well-prepared. Once you determine where you will use each video and understand the purpose of each, it’s time to gather all needed materials (if you are filming on your own) or make notes (if you are outsourcing) to give to an agency or freelancer. This last bullet point is specific for increasing AOV. Use YouTube’s annotation capabilities to add clickable links to any additional products shown. This is the main portion of all of your videos for this particular product. It is the most important shot. Here are a couple notes to give to your videographer or to keep in mind as you edit. It needs to look clean. This means well-lit on a simple background, usually black or white. Consumers associate cleanliness with trust. Without trust, no one will buy from you. Keep it simple! Product page videos should be less than one minute in length. Other videos mentioned in this guide will add bumpers to the beginning and end of these videos, or cut from this video, for usage elsewhere. Simple and to the point is best. See the video on Kelty’s product page here. Get your welcome series and all other nurture streams automated now. Use your preferred email marketing automation provider with a one-click integration. Browse your options here, or use the BigCommerce API to customize for your brand’s needs. In this post, I’m focusing solely on a welcome series email. This is because a welcome series email video can be used for a number of assets outside of a welcome series email. This makes it one of the most efficient videos to knock out early on and use across a variety of channels. A welcome series product video is meant to encourage conversion and brand loyalty. You want to build trust and interest. Use your best selling product video to show off what you brand does well. Provide a quick intro, which you can create using a voice-over or a specific intro bumper to a product video you’ve already created. Once this video is created, use it as the main video on your YouTube page. This is the first video people see when they land on your channel. 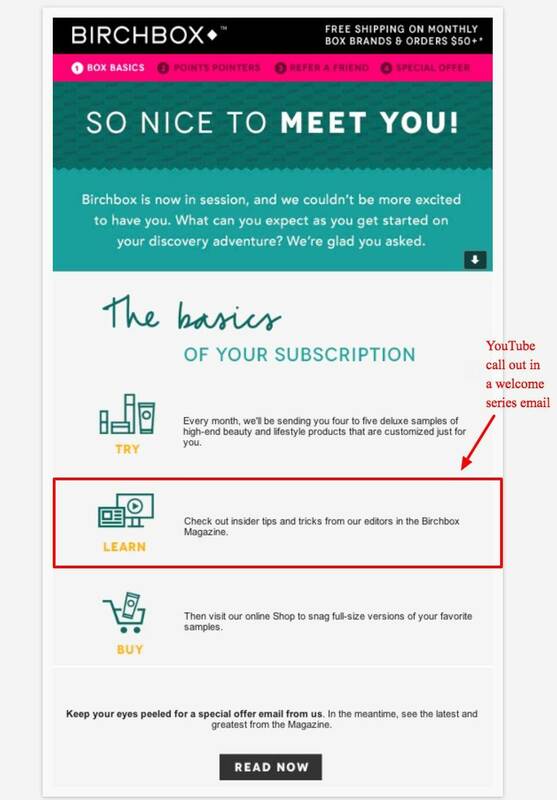 You can either use that video in the first welcome series email, or look to brands like Birchbox, which outline various brand resources for new customers, and point them to the brand’s YouTube channel where the Welcome video lives. And here’s the first video you see when you land on the brand’s YouTube channel. Read the complete guide to Facebook Advertising to learn how to get started and then how to scale to grow sales through social media advertising. Videos are perfect fodder for Facebook and Instagram advertising. You can use a welcome series video to pull in net new customers with Facebook advertising. You can also use product-specific video to capture net new customers in niche markets as well as re-target customers who viewed a product page but didn’t purchase. Because of the social aspect of these platforms, customer reviews or testimonials play very well. Consider including one or two in your video ad. Facebook and Instagram both have specific design, size and targeting requirements for their platforms. Be sure you follow these when uploading your video ad in order to expedite the time it takes for the companies to approve the ad and launch it. Be sure to include a link with your video. 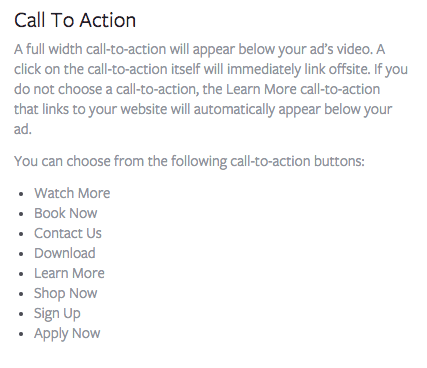 When you include a link, Facebook gives you the options of several CTA buttons. Depending on your audience, you’ll likely want to use Shop Now, Learn More or Sign Up. This last option will grow your marketable email base, pushing them to a welcome series. So be sure your welcome series video is a bit different than the one you use on a Sign Up CTA on Facebook –– or create a new stream for Facebook sign ups specifically, and exclude the video. You have eight CTA options with Instagram. As with the Facebook ad, most shops will want to use Shop Now, Learn More or Sign Up. Once you have your product video strategy down, the next step is production.